If EA Bioware play their cards right Anthem - a new 3rd person multi-platform Action/RPG/shooter that at first glance is EA's response to Destiny - could be the biggest videogame release of 2019. That's contingent upon a flawless launch, for which the pre-release Demo experiences double as load-tests for the game's front and back-end. The first of these demos began on Friday, and it's fair to say that things didn't go exactly to plan. Bearing in mind that the Antehm VIP Demo was restricted to game pre-order holders and EA Origin Access subscribers, an inability for the log-in servers to handle the spike in player numbers was an immediate red flag. Furthermore server stability was inadequate; users reported rubber-banding and other server-side issues that speak to critical inadequacies for an always-online title. And this is before one addresses the topic of whether the demo experience adequately reflects end-game (in addition to hiding the almost inevitable microtransaction store). Over the weekend however Chad Robinson, Bioware's Head of Live Services, was on hand to explain what went wrong, and how they're addressing it in the short-term. - Platform connections – this was caused by the spike in players entering the game when we opened up. Unfortunately, these issues did not present themselves during our internal testing. Investigations are ongoing, and we will continue to apply fixes throughout the weekend. - Entitlements – these are account flags that grant players things like their pre-order incentives and demo access. During the demo weekend, we identified a bug where VIP players with a specific combination of entitlements were being blocked from accessing the demo. We believe we’ve resolved most of these, but have additional cases we are addressing. - “Infinite loads” – this is occurring for some players, particularly when they transition from Fort Tarsis to an expedition. We saw this only in isolated cases during internal testing and believed it was resolved. Unfortunately, the problem is exacerbated in the real-world where differences with player’s ISPs and home networks introduce new behavior. - Continue to resolve any reports of issues with login and entitlement problems. - Implement fixes to address “infinite loads”. I want to be upfront that this is a difficult one, and something we may not resolve during this weekend — many players are not seeing this issue and the last thing we want to do is destabilize the experience for everyone. - Improve server performance. We’ve heard reports of rubber-banding and other signs of server latency. We believe we can address this and will be conducting some small-scale experiments to confirm that. We may roll some fixes out this weekend or may wait for the open demo next weekend, depending on the level of risk to the overall service. Robinson continued by expressing Bioware's satisfaction at the popularity of Anthem's VIP Demo on Twitch, where it garnered 100M minutes watched and 300K concurrent viewers across all streamers. 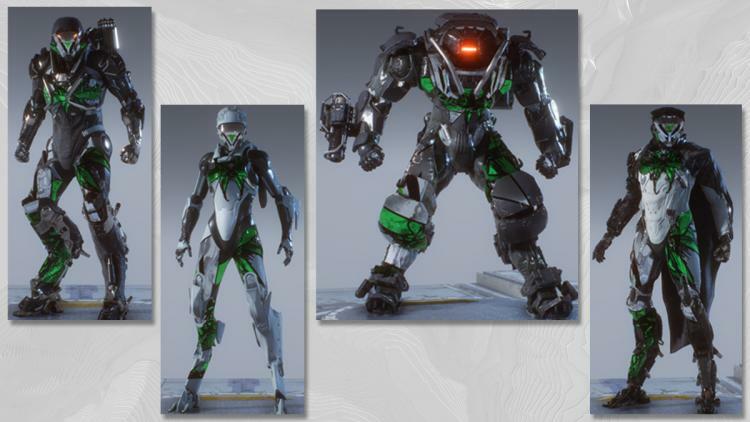 He apologised for the demo's shortcomings, thanked participants and offered them a new 'Vinyl' cosmetic for their Javelin suit when the game launches (see: top), and pledged to maintain good communication through the pre-launch period. EA stated in December that a demo open to all-comers would be available from February 1st to the 3rd, but mention of that demo has been scrubbed from the official Anthem Demo page. It's not unlikely that further demo weekends will be announced prior to the game's launch on February 22nd. Hopefully EA will also address the mediocre quality of the PC port before then.